October, and our summer-long parade of the planets is over. Venus has disappeared round the Sun and Jupiter is only just visible in the glow of the sunset. Look for it as soon as the Sun has gone and don’t hang about; it too will set at around eight. A thin crescent Moon is just above it on the 11th. NASA launched a probe to this giant planet seven years ago, called Juno, and it has been sending amazing pictures back since it arrived there in June. We still have Saturn in the south, in the same position that Jupiter was a month or so ago but, being further away, not as bright. It is, however, a little higher because the Earth is now starting to tip its head away from the Sun, lifting the night sky as it does so. Look out for Saturn as soon as the sky is properly dark, it’s alone in this part of the sky, there being no bright stars nearby. The Moon visits it on the 14th. Saturn had its own probe until a year ago, Cassini, and it also sent wonderful pictures back, especially of the extraordinary ring system for which this planet is famous, and the effect the various moons had on them. Saturn has many moons but probably the most famous of them is Titan. A probe was landed here in 2004, Huygens, which hitched a lift on the side of Cassini. It revealed a strange world of rocks made from super frozen water and oceans of liquid methane. Now we come to Mars. It has been dominating the skies in the late evenings but is now very obvious much earlier. Left of Saturn and at a similar height, its orange colour can be clearly seen and it will look spectacular with the Moon close by on the 18th. 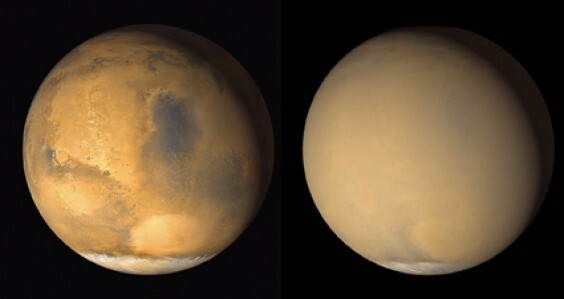 Mars has had numerous probes sent to it over the years and its surface is littered with landers. It still has about six active orbiting craft, but down on the surface there is some bad news. Opportunity, a rover which has been trundling about the surface for more than 14 years, doesn’t seem to have survived the recent dust storm (above) which engulfed the planet in June. NASA has been sending it a simple instruction to just beep if it can hear but there has been no reply. Doesn’t that seem so sad? So, when you’re gazing up at Red Planet, think of that little rover sitting there, covered in dust and unable to speak. It has sent back lots of science, though, and excellent pictures, as, indeed, its younger and larger cousin Curiosity continues to do. While you’re admiring bits of our Solar System, keep an eye out for meteors as there are two minor showers this month, due to peak on the 10th and 21st. There are a couple of launches to the ISS due too, so keep another eye on http://www.heavens-above.com to see if they are visible above Alvechurch.